my very good friend and a fine 6cm operator who passed away in May 2002. 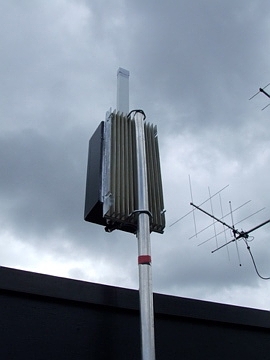 The 5.7GHz beacon GB3KEU is now finally on air! On the 6th of April 2008, at 1115 UTC, I "pulled the big switch" to end some 4 years of waiting and frustration! This is my first attempt at a beacon but it may not be my last. 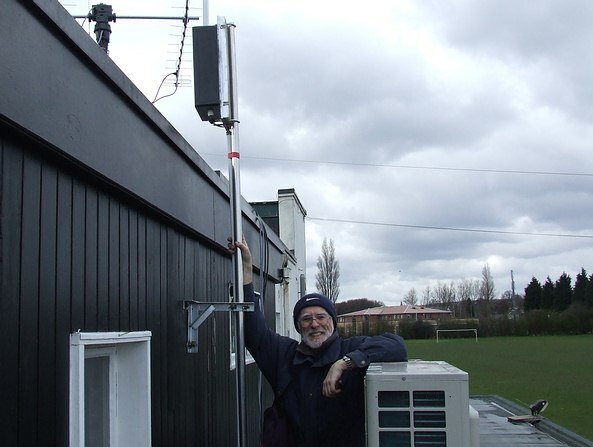 On Sunday, 6th April this year, the 5.7GHz Sheffield beacon GB3KEU was finally switched, on after a long period of uncertainty of where it was to be located. The idea of a beacon in memory of the late Tim Leighfield, G3KEU,(seen here in the photo right)came soon after his death in May 2002 but, for various reasons, its taken me almost 6 years to turn an idea into something that can now be heard! Initial plans were to build and locate it, along with a 24GHz beacon GB3BNL in honour of the late Les Sharrock, G3BNL, at Alport Height (IO93FB). However, there were a couple of problems that prevented this, one being the installation of a 5GHz broadband system at the site and it also struck me that having amateur beacons on a commercial tower, though rent free in this case, would not be good in that I could not readily access them at times convenient to myself. 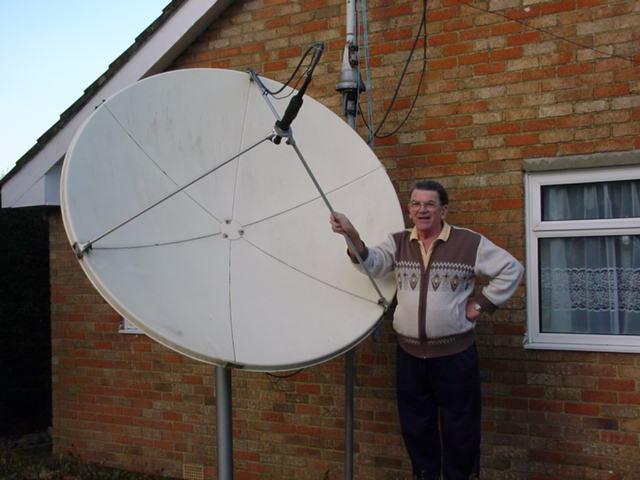 Lack of time to build the two beacons then followed as I became Chairman of the UK Microwave Group, a job (in my case with the Scatterpoint newsletter editorship in addition!) does not leave much time for anything else! GB3BNL is still not built but I have given all the modules and components for it (less an antenna)to Gordon, G0EWN of Sheffield. He has already built the G8ACE Ovened controlled oscillator for it and plans to run it from him home as a personal attended beacon under his own callsign under a suitable location for the GB3 beacon is found. truly a great team effort by several people, to whom Im eternally grateful. The G8ACE oscillator appeared to be extremely stable when listening at the 120MHz crystal frequency. By this time, early Autumn 2007, we already had a beacon application in the pipeline to OFCOM but the wheels were still turning a little slowly (but much faster than a year ago!). Then suddenly, at the end of last year, 2007, things got a move on and the NoV arrived at the end of January this year and so I just had to get the beacon up and running before the statutory three months were up before the NoV become null and void. The site for the beacon remained a problem until the middle of last year until I casually mentioned it at our local radio club. 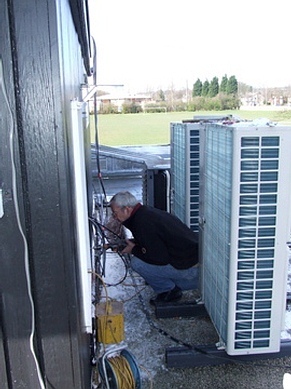 The chairman suggested we might approach the management of the Sports Club where we rent club premises. They seemed agreeable that we install the beacon on the roof of our club shack, near to other antennas we already had there. The site is at NGR 350811, approximately 190m above sea level, with the actual beacon some 12m or so above ground at the present time. Where we have fixed it to the roof at present(see photo left)is not ideal as part of the Sports Club building blocks the take off to the west. We plan to raise the beacon height in the coming months. Still, its a fairly good take off in the other directions. On its first day on air it was heard via rainscatter at G4BRK in IO91 and also over the Pennines in Shropshire, IO83RR, by G3UKV (its worse direction). Hopefully other reports will come in in due course. After installing the beacon, with the help of club members Steve, M1ERS (shown right drilling holes in the wall for the mast brackets)and Trevor, M0TWS,I drove 50-60 miles around the Sheffield area, for 2 hours, to listen for it. The receiver was my 5.7GHz transverter with a WA5VJB pcb log periodic 2-6GHz antenna into an FT290 as the I.F., both on the floor of my van! I could hear the beacon in the most unlikely places, in the bottom of deep, steep sided valleys and behind large hills. Huge Doppler effects made the whole 5.7GHz mobile experience something quite memorable!